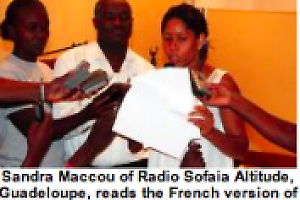 The International Association of Community Radios (AMARC) held a special meeting in Haiti on May 9. PORT-AU-PRINCE, May 9, 2011 (IPS) - "In my opinion, there is no such thing as a natural disaster," says Sylvia Richardson, a volunteer broadcaster, mother of two, assistant librarian, and the new vice president of the North American region of the World Association of Community Radio Broadcasters (AMARC). "Poor people are forced to live in conditions that make them vulnerable. The real question is, why do we have this idea that poverty is 'natural'?" she asked.